Can Elite: Dangerous Challenge EVE Online? The folks behind Elite: Dangerous are smart folks. Smart enough to recreate the Milky Way galaxy - our galaxy, with all its Keplerian parameters and such - in the game. (If you see it, either in the night sky or in-game, you can indeed fly to it.) Smart enough to have their UK-based offices in Cambridge, where you know the happy hour conversations are a few notches on the IQ scale above ranting at local sports figures. And smart enough to know that porting their game to Xbox One, cool as it is (and perhaps necessary for the good of the game, more on that in a second), does not by itself an E3-worthy announcement make. Which is perhaps part of the reason their choosing the Xbox One version of the game to debut CQC, or Close Quarters Combat. 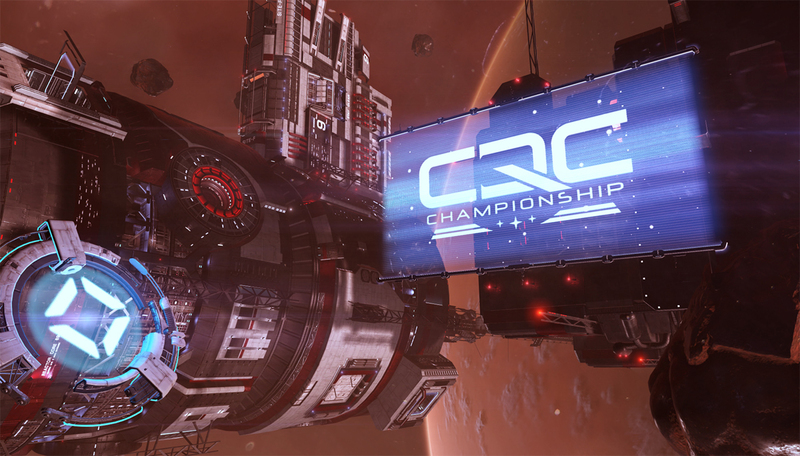 A self-contained arena game mode, CQC will pit pilots against each other in some of the smallest, most nimble craft the game has to offer. You'll need them too, with quarters being quite close indeed around the space station arena. Some passages looked to be barely a ship and a half wide, and with the newly added mechanic that lock broken with loss of line of sight, pilots will want to make use of those passages to shake a persistent tail. Several game modes will be represented, including deathmatch and a CTF analogue called capture the data sphere. Data sphere carriers trail a luminous blue flare effect that leaves no doubt about who has the data sphere or where they're going. Should you find yourself in possession of an illicit sphere, you'll want to avail yourself of four different types of drive-thru power ups - shields, stealth, weapons, and engine boost - available around the map. Getting good at CQC will reward you with items that make you even better at CQC. As to what you can take from CQC into the rest of the game, Executive Producer Ben Dowie noted you can take the skills you pick up along the way as well as bragging rights, but naught else. The intent is to keep this side of the game separate from the PvE side of the game, separate from the PvP side of the game. This is more to prevent massive gains and losses from imbalancing and sapping the fun from the game, but also because Frontier isn't ruling out an eSports presence for Elite Dangerous. Also in from the promises promises department, CQC will make its initial appearance in the Xbox One version of the game, but PC users will eventually get it for free. CQC wasn't playable at E3, but we did get some hands on time with the Xbox One version of the game. 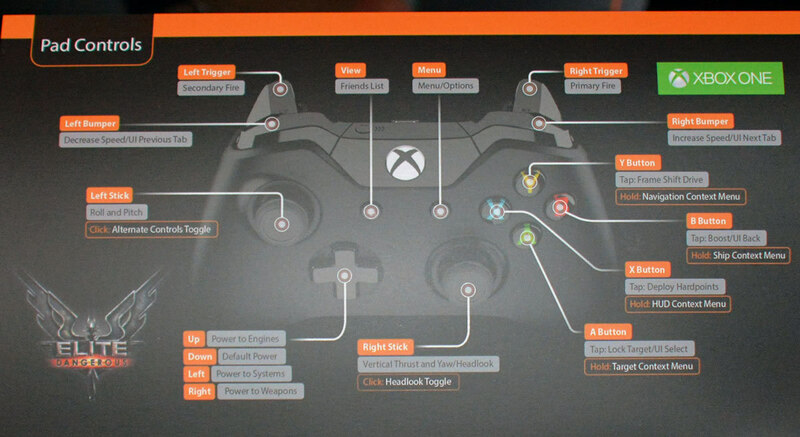 While PC players could elaborately keybind their way to Xbox controller prowess on PC, Frontier did a masterful job of putting the games most used functions at your thumbtips (and index fingertips). I initially found Elite Dangerous a little clunky on the mouse and keyboard but picked up even the finer mechanics like power allocation in about 30 seconds on the controller. Less used functions like deploying landing gear will still take some menu scrambling, but on the whole I felt like you sacrificed little to gain much in control. Our appointment concluded with a quick five minutes playing the game on an Oculus VR and a Saitek X52 Pro throttle and flight stick. This, at last, was clearly how this game was meant to be played. Ships like the Imperial Courier that sport a 180 degree glass viewport allow you to have that true Top Gun flyby experience. A nice touch, though it wouldn't help you unless you were using the X52 or something similar, was that hand movements on the throttle and finger movements on the flight stick top buttons are mimicked by your pilot in game, allowing you some welcome visual cues as to where your real life fingertips are. My colleague Reuben's firing accuracy and ability to follow enemy units increased tremendously, and so did his enjoyment of the game. Mine did too. We could have kept fistfighting for turns on the Oculus, but our next appointment beckoned. 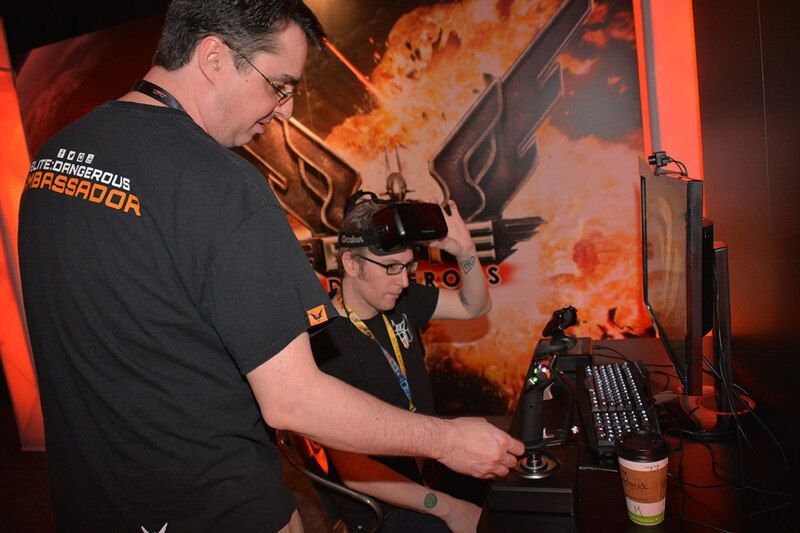 Our thanks to Ben Dowie and the player ambassadors stationed at the booth for allowing us to experience the interesting evolution of Elite Dangerous.